It’s almost time for camping season. 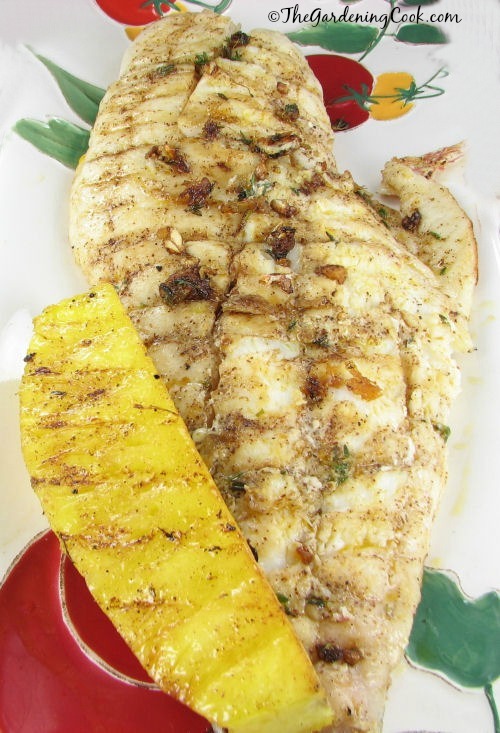 I thought it would be fun to start the season off with a great recipe for Caribbean grilled snapper with pineapple. It also gives me a chance to show off my new toy – a wonderful fish shaped grill pan from my new sponsor Gourmet Grillware . The company recently offered me this grill pan to test with one of my new camping recipes. I must say, I am impressed with the grill pan. Not only does it make a wonderful presentation for the fish, but it is extremely versatile as well. You can cook on a stove top, over an open fire, or on an outdoor barbeque. It also goes from freezer to oven to tabletop to fridge. The only thing that you cannot do it wash it in the microwave, but it is very easy to clean as long as you remember to lightly oil it before you first use it. This will help to protect the finish. What a wonderful utensil to take on your next camping trip! 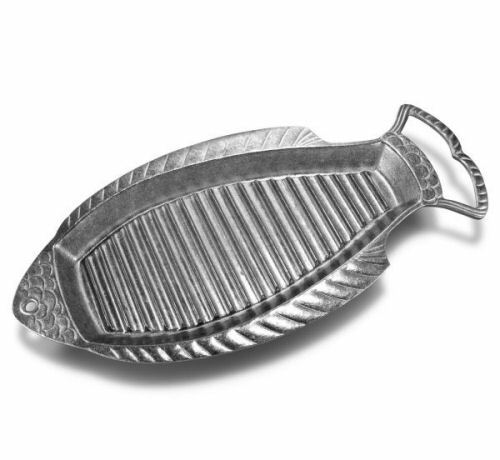 Be sure to visit Gourmet Grillware to see more details about this great fish griller. You will love it as much as I do! (affiliate link) I promised the company that I would try out a recipe suitable for the campfire. 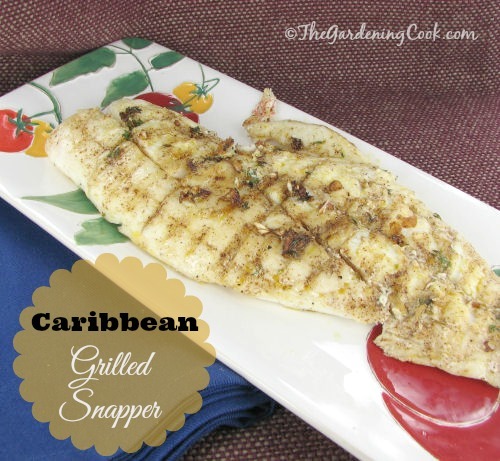 This Caribbean snapper with Grilled pineapple is a perfect choice. Mix the ginger, garlic, chili powder, thyme and allspice together. Transfer the paste to a small bowl and mix in the oil. Make 3 - 3-inch-long slashes on the snapper about ¾" deep. Lightly season the fish with the Kosher salt and rub it with the paste, being sure to get the spices into the slashes. Rub the fish all over with olive oil. Coat a large grill pan (or outdoor grill) with some olive oil. Set the fish on the grill pan and cook over moderate heat, turning once, until the flesh just flakes with a fork, about 20 minutes. About 5 minutes before the fish is done, sprinkle the pineapple with cinnamon sugar and add to the grill pan. Turn to heat on both sides. Disclosure of Material Connection: I received one or more of the products or services mentioned above for free in the hope that I would mention it on my blog. Please note that I only recommend products or services I use personally and believe will be good for my readers. I am disclosing this in accordance with the Federal Trade Commission's 16 CFR, Part 255: "Guides Concerning the Use of Endorsements and Testimonials in Advertising." I like the vegetable tray in the fruits and vegetables collection. LOVE the collegiate products – would love to get something personalized from my college for game days!! So great! Reggae gravy boat and tray has been an item I have always desired.